The model for the electric alignment of the planets in the ecliptic plain was first developed, more than 200 years ago, by Sweden's Hannes Olof Alfven - pioneer explorer of solar plasma physics and the electric nature of the sun and the solar system. 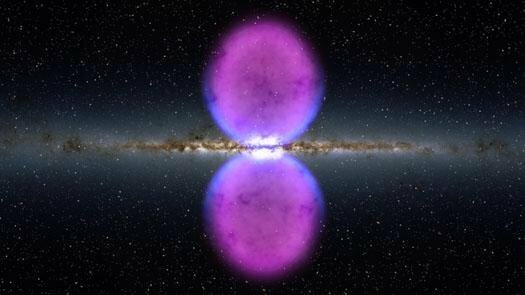 Recently NASA’s Fermi Gamma-ray Space Telescope has unveiled a previously unseen structure centered in the Milky Way, seen in x-ray and gamma-ray light as a feature of electric phenomena that spans 50,000 light-years, perpendicular to the galactic plane. Thus, we are able to see with advances capabilities what Alfven had only been able to see as a theoretical construct. Below is simplified version, a relatively early concept, with the mirroring omitted, is shown below. The same basic model applies also to the solar system in the small, which is deemed encapsulated in its own electric plasma structure called the heliosphere. Within the heliosphere, aligned with the electrically organized ecliptic, a plasma current sheet has been discovered the furnishes a return path of plasma particles back to the Sun. This is not what powers the Sun, but is a part of the evidence of the electric powered sun, which also has an effect on the organization of the solar system. The lawful interrelationship of the speed of the orbits and their distance from the Sun was discovered by Germany's Johannes Kepler - "father" of modern science, as a principle of "equal area in equal time." 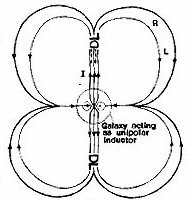 But it was not known then that the principle he discovered reflects itself a deeply causative underlying principle of interrelationship of electric and magnetic forces. Some rather puzzling questions arise when the solar system is looked at outside of the electric context. The most puzzling aspects of the solar system are the apparently random tilt of the planets' spin axis, and their rotational speed. 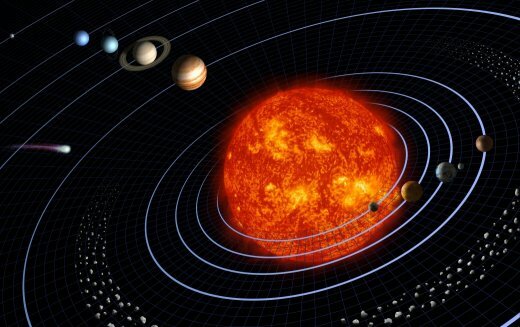 In principle all planets of the solar system, including the Sun itself, spin in a counterclockwise direction. Even the planetary orbits around the Sun are in the counterclockwise direction. Venus doesn't comply with the rule. It spins backwards and very slowly, and Uranus spins sideways, being tilted 82 degrees. How is one to resolve these puzzles? From a gravity-only standpoint they are inexplicable, but not so from an electric standpoint. So what's happening? From the electric standpoint this is not a puzzle. While Mars has no magnetic field, the majority of its surface is electrically conductive. Much of it is covered in iron oxide, some in nodules by the trillion, and some as dust forming dunes a thousand feet high. The surface of Mars offers easy paths for electric interaction with inflowing currents that create their own magnetic forces to establish planetary rotation according to the principle of the homopolar motor. See: Oceans of Sand on Rocky Shores The same electrically conductive feature is found on Earth in the form of the oceans. But why then doesn't Venus spin likewise without a magnetic field? It doesn't, because apparently it doesn't have these features. Its atmosphere is electrically non-conductive (carbon dioxide), and its surface is dry, hot (460 degrees C) and rocky. It offers nothing for electric currents to latch onto. Consequently it isn't a powered planet. The only rotation it seems to inherit comes from the Sun's gravitational 'tidal' action, which like a mashed gear makes it rotate in the opposite direction - slowly, for reasons of the weak interaction. The surprising outcome is that all planets would have stopped spinning by now, or spin backwards like Venus, if they were not actively powered by inflowing electric currents. Another myth is that the planets of the solar system condensed by gravity from a giant accretion disk, like the rings of Saturn. The problem with the accretion-disk theory is that the rings of Saturn don't match the theory. The rings of Saturn are primarily water ice fragments that appear to have resulted from a process of electric stress fracturing of one of its moons, which became electromagnetically aligned by the planet's 'heliospheric' current. The asteroid belt between Mars and Jupiter may have had the same type of origin, resulting from electric stress fracturing, rather than collisions. The most likely process for the forming of the solar system is that the entire system was formed together is a single process with the spacing between the planets determined by the wavelength of the plasma currents and the resulting z-pinch nodes that become centers for the forming of the planets. The entire process would likely have occurred in the star-forming region at the center of the galaxy where immense plasma currents converge. The harmonic pattern of the planetary spacing would reflect the increasing plasma density towards the central node in which the forming of Sun occurred. 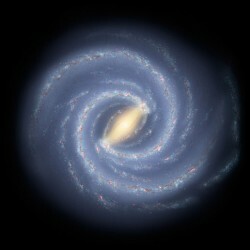 Our galaxy, the Milky Way galaxy, is recognized to be a typical barred galaxy with a central star forming region that is between 3,300–16,000 light years in length. The same type of electromagnetic forces that in the small accelerate the solar winds from the Sun would in the large accelerate the formed star system away from the high intensity creative center. With the galaxy containing 200 to 400 billion stars or star systems, and considering the speed of its rotation and expansion, a production rate of ten to twenty star systems per year would likely be occurring. The galactic disk is extends outward to 100,000 light-years across. It is believed to be a 1,000 light years thick within a 10,000 ly thick layer of plasma. The modern perception is that the edge of the galaxy is not sharply defined. The star systems are accelerated away from the galactic center at a speed of 210 and 240 km/s which is roughly equal to the slow end of the speed of the solar wind around the equatorial plain. The stellar disc does not have a sharp edge, a radius beyond which there are no stars. Instead, the number of stars drops smoothly with distance from the center of the galaxy. Beyond a radius of roughly 40,000 ly, the number of stars drops much faster with increasing radius for reasons that are not understood. The galactic disk itself is surrounded by a spheroid halo of old stars and globular clusters, of which 90% lie within 100,000 light-years (30 kpc), suggesting a stellar halo diameter of 200,000 light-years. However, a few globular clusters have been found farther, such as PAL 4 and AM1 at more than 200,000 light-years away from the galactic center. About 40% of these clusters are on retrograde orbits, which means they move in the opposite direction from the Milky Way rotation. The globular clusters can follow rosette orbits about the galaxy, in contrast to the elliptical orbit of a planet. The Sun is currently 5–30 parsecs (16–98 ly) from the central plane of the galactic disc, at a distance of 7.62 ± 0.32 kiloparsecs (24,900 ± 1,000 ly) from the Galactic Center, and moving away from it. From the standpoint of purely gravitational dynamics the observed phenomena make no sense and can only be explained by imaging the inclusion of 'epicycles' such as dark matter. But in the electric Universe no ambiguity exists. The 200,000 ly halo becomes a plasma sphere of networks of Birkeland currents with powerful nodes in which the star clusters are born, with the more distant clusters being born in the external Birkeland currents that are flowing into or through the galactic center from the intergalactic plasma streams. Actively powered (visible) star systems do not exists outside the galactic environment where the intergalactic Birkeland currents are concentrated into z-pinch nodes. These currents are simply not dense enough to light up a star. When the star systems drift outside the envelop of the power streams of the galactic plasma currents, the stars simply go dark, beginning with the faintest, progressing to the strongest. This happens beyond the 40,000 ly radius of our galaxy. This will likely be the fate of our sun in a few billion years, too distant in in time to warrant one to worry about. This observed phenomenon of the differences of the spin-axis orientation of the planets in the solar system poses a big problem for the gravity-only perception of the universe. None are identical. Some are close, and some way off. Also the composition of their atmosphere is different in ever case, and likewise is their density. Neither of these characteristics match that of the Sun. Doesn't this suggest that none of the planets were derived from the Sun or from the material that created the Sun? The obvious answer is that none of the planets originated in the solar system, but were acquired by the Sun from different sources. The Earth, Mars, and Saturn might have been acquired as a family in a merger with another solar system. 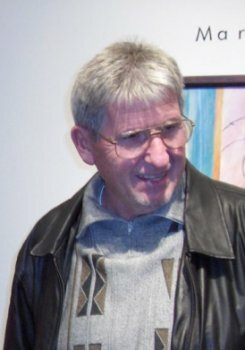 Since planetary acquisition, much less the acquisition of an entire solar system, is not possible with the weak force of gravity that diminishes with the square of the distance, the process could only have been carried out by the electric force that is 39 orders of magnitude stronger and diminishes in a linear manner over distance, which is an enormous difference. The point is that in the electric universe immensely stronger forces are acting on the planets than merely gravity, of the kind we are just beginning to explore. 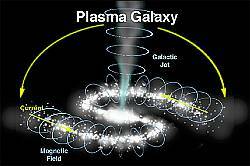 In the galactic environment gravity is primarily a local force with a small effect, while the electric force is a galactic and intergalactic force, with an unlimited range. It is fairly save to say, given the numerous forms of evidence, that the solar system and life on Earth would be radically different without the electric forces playing a major role in so many ways. Without them life would likely not exist. Of course, by understanding these forces, we can develop means to utilize them, especially the electric forces to power of world with for a bright and energy-rich future. The point is, that the immense electric effects that we observe throughout the solar system, that order its functioning, point to an amazingly powerful electric energy environment surrounding our planet. While we don't know yet how to tap into the galactic electric energy, our growing knowledge seems to have brought us to a breakout in scientific achievement that will invariably enable us to get the needed technological development started. The iron-clad hold on science that the masters of empire presently exercise, who will likely evaporate in the near future whereby real scientific development begins to happen.